Anyway, I digress! Another thing that I love about Autumn is that it makes me want to bake. I find baking seriously soothing and I always feel so accomplished when a recipe comes together! I love filling the house with amazing smells – like bread and cinnamon! This recipe happens to contain both of these things! Hurrah! 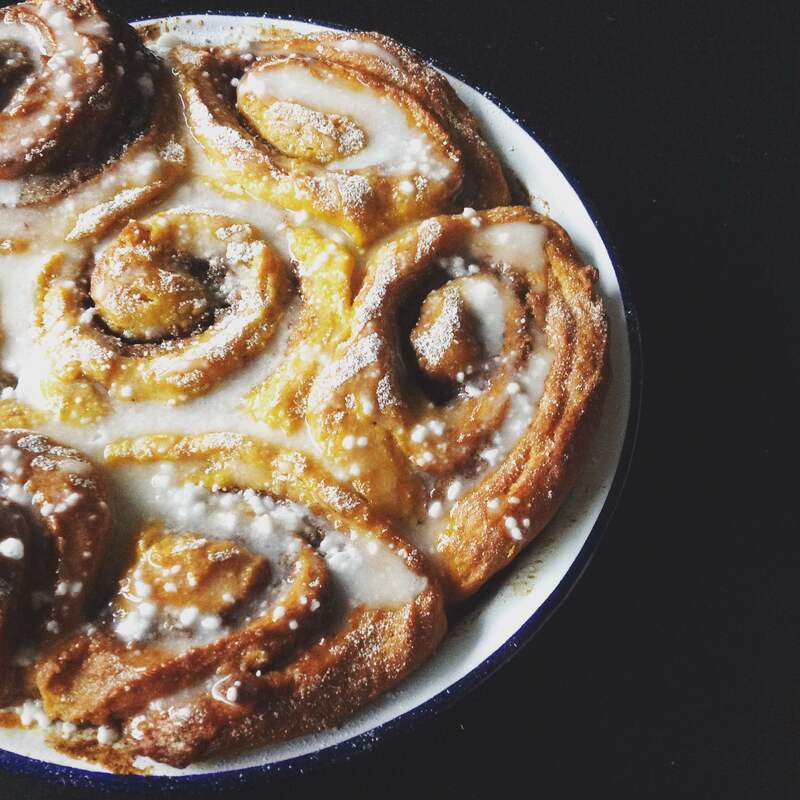 I have wanted to make cinnamon swirls for a while now, but I really wanted to do something different and I thought hey – what would happen if I threw pumpkin puree into the mix? Well, I can tell you now – magic happens. Now this isn’t a quick recipe, it contains dough which needs time to rise. But believe me, it is worth it! If you have a stand mixer then it is even easier. My stand mixer is something else I love, but I am pretty sure you already knew that! This recipe makes 11 large buns. You will need a baking tray to cook them in, I used two round pie dishes. 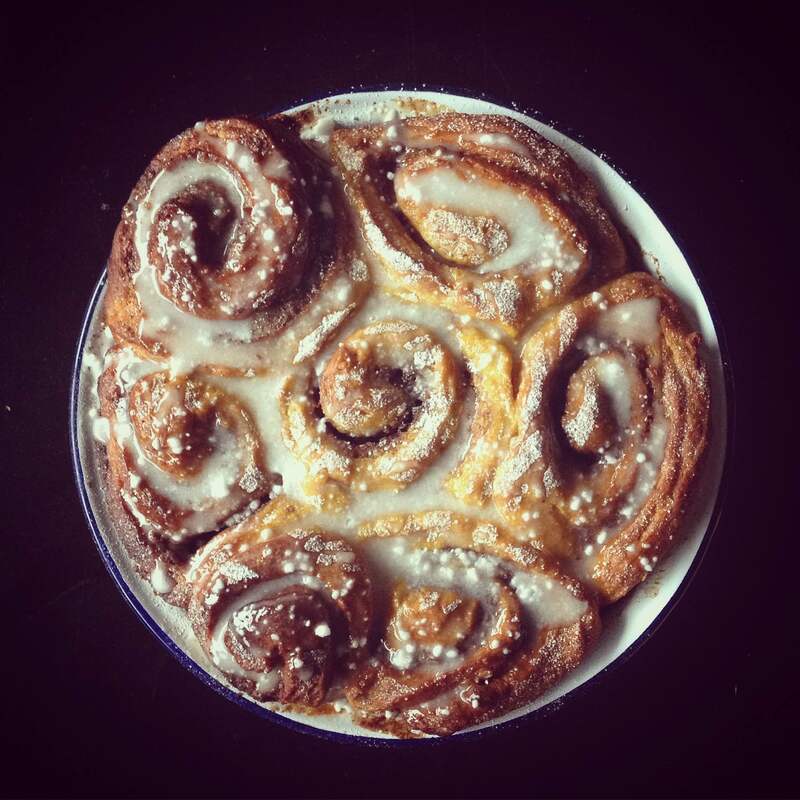 A word of caution – these buns will rise again after you put them into the pans – I didn’t realise how much they would rise and nearly had a bun-tastrophy! Make sure you leave a bit of space around the buns to allow for this! Separate your filling ingredients and set aside. Take your dough ingredients. Melt the butter in a pan. When the butter has fully melted, add the milk and warm gently. Do not allow this mixture to boil, you are looking for a warm, golden liquid mixture. Sift the flour, baking powder and bicarbonate of soda and set aside. Keep 50g plain flour separate. Add the pumpkin, sugar and salt to your mixing bowl. 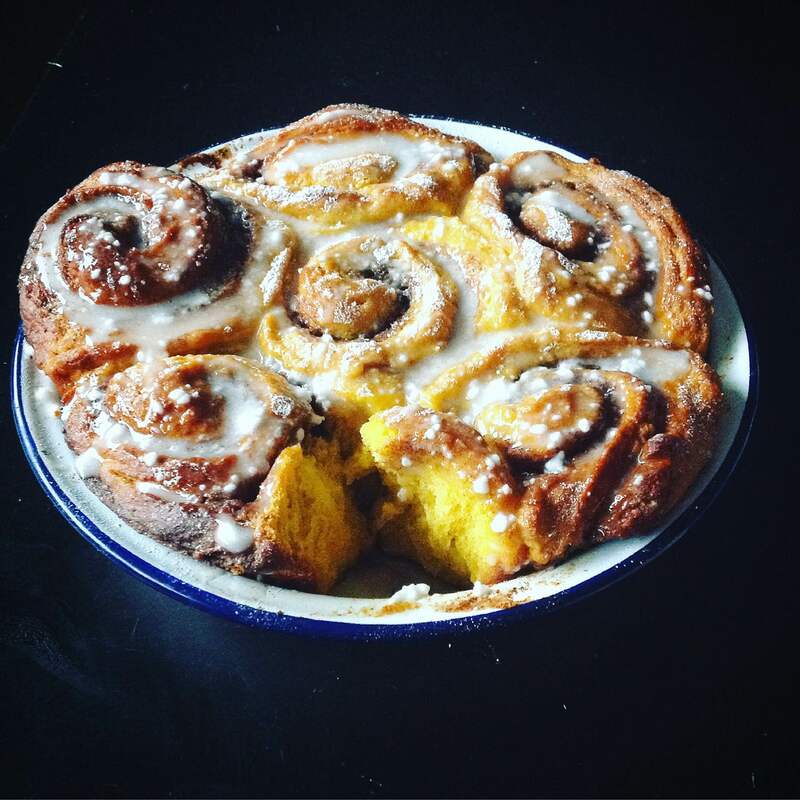 I used a stand mixer to make my buns, if you don’t have one then I would recommend using an electric hand mixer – there is a lot of stirring involved. Using the paddle attachment, combine the puree, sugar and salt. Slowly add the warm milk and butter mixture. When this is combined, add the egg and yeast. Mix on low (I used speed 3) for about 5 minutes. Add the flour mixture, slowly. Keep the mixer going whilst you add the flour. You should have something between a batter and a dough. You may be concerned that this is far too wet, don’t worry – all will be well! Beat for 5 minutes on medium (level 5). Scrape the mixture into a greased bowl, cover with clingfilm and leave to rise somewhere warm for at least an hour. After an hour, you should have a bowl full of expanded dough. Dust some plain flour in and punch the mixture back. It will still be very sticky at this point. Dust the surface with more flour, dust your rolling-pin and dust your hands. Tip the rest of the plain flour into the dough. Squidge the dough around and tip out onto the floured surface. Roll this out into a rectangle shape about 1cm thick. If the dough sticks to your rolling-pin or surface just dust it with more flour. Ready your filling ingredients! Things are going to get exciting. Melt your coconut oil until liquid. Brush this over the dough rectangle. Scatter the coconut sugar, vanilla powder and cinnamon evenly over the whole rectangle. Roll the dough length-ways until you have what looks like a soggy Swiss roll. Take a super sharp knife, slice into 11 equal pieces. You could slice it into 12 pieces, but the buns will be smaller and no one wants that! Arrange the rolls in a greased cake pan/pie dish/baking tray. Cover with clingfilm and allow to rise for about 45 minutes. Preheat your oven to gas mark 5. Remove the clingfilm and bake for about 45 minutes. The buns will be done when they are a beautiful golden brown. Check at the 30 minute mark to ensure that they aren’t burning. When cooked, remove and allow to cool before icing! Top with icing sugar or sifted icing sugar, or cream cheese frosting, or any kind of frosting! This dish is best served warm, but if you can’t manage to eat all 11 buns in one sitting, then they will keep for up to 3 days. I would advise not putting them in the fridge as the dough can harden up. I cannot begin to tell you how delicious these buns are. The pumpkin purees helps makes a beautifully moist dough, which is strengthened by the inclusion of strong bread flour. My house smelt insanely good when they were baking. Cinnamon, pumpkin, vanilla, bread. I mean come on! Can you get any more autumnal than that? I hope you enjoy this recipe! Bon appétit! Posted on October 21, 2015 January 6, 2016 by TinaManahaiPosted in Autumn, RecipeTagged Autumn, bake, breakfast, Brunch, buns, Cake, cinnamon, delicious, Food, halloween, pumpkin, recipe. Oh wow! I need this in my life!